For environmental samples, one must normally resort to electron microscopy for positive identification.However today gravimetric and PCM/PLM techniques are employed, which cannot readily identify the smallest, most hazardous, fibers. These techniques being limited to PM10 particulate size evaluation which completely ignores UFPs. Chrysotile, CAS No. 12001-29-5, is obtained from serpentine rocks which are common throughout the world. Serpentine rock is also the state rock of California. Its idealized chemical formula is Mg (Si O )(OH) . Chrysotile fibers are curly as opposed to fibers from amosite, crocidolite, tremolite, actinolite, and anthophyllite which are needlelike. Chrysotile, along with other types of asbestos, has been banned in dozens of countries and is only allowed in the United States and Europe in very limited circumstances. Chrysotile has been used more than any other type and accounts for about 95% of the asbestos found in buildings in America. Applications where chrysotile might be used include the use of joint compound. It is more flexible than amphibole types of asbestos; it can be spun and woven into fabric. The most common use is within corrugated asbestos cement roof sheets typically used for outbuildings, warehouses and garages. It is also found as flat sheets used for ceilings and sometimes for walls and floors. Numerous other items have been made containing chrysotile including brake linings, cloth behind fuses (for fire protection), pipe insulation, floor tiles, and rope seals for boilers. Crocidolite, CAS No. 12001-28-4 is an amphibole found primarily in southern Africa, but also in Australia. It is the fibrous form of the amphibole riebeckite. One formula given for crocidolite is Na2Fe2+3Fe3+2Si8O22(OH)2.Notes: chrysotile commonly occurs as soft friable fibers. Asbestiform amphibole may also occur as soft friable fibers but some varieties such as amosite are commonly straighter. All forms of asbestos are fibrillar in that they are composed of fibers with widths less than 1 micrometer that occur in bundles and have very long lengths. Asbestos with particularly fine fibers is also referred to as "amianthus".Amphiboles such as tremolite have a crystal structure containing strongly bonded ribbonlike silicate anion polymers that extend the length of the crystal. Serpentine (chrysotile) has a sheetlike silicate anion which is curved and which rolls up like a carpet to form the fiber. Other regulated asbestos minerals, such as tremolite asbestos, CAS No. 77536-68-6, Ca2Mg5Si8O22(OH)2; actinolite asbestos (or smaragdite), CAS No. 77536-66-4, Ca2(Mg, Fe)5(Si8O22)(OH)2; and anthophyllite asbestos, CAS No. 77536-67-5, (Mg, Fe)7Si8O22(OH)2; are less commonly used industrially but can still be found in a variety of construction materials and insulation materials and have been reported in the past to occur in a few consumer products. Other natural and not currently regulated asbestiform minerals, such as richterite, Na(CaNa)(Mg, Fe++)5(Si8O22)(OH)2, and winchite, (CaNa)Mg4(Al, Fe3+)(Si8O22)(OH)2, may be found as a contaminant in products such as the vermiculite containing zonolite insulation manufactured by W.R. Grace and Company. These minerals are thought to be no less harmful than tremolite, amosite, or crocidolite, but since they are not regulated, they are referred to as "asbestiform" rather than asbestos although may still be related to diseases and hazardous. In 2006, 2.3 million tons of asbestos were mined worldwide, in 11 or 12 countries. Russia was the largest producer with about 40.2% world share followed by China (19.9%), Kazakhstan (13.0%), Canada (10.3%), and Brazil (9.9%). Asbestos was named by the ancient Greeks, although the naming of minerals was not very consistent yet at that time (the modern Greek word ἀσβεστος stands for lime, not for the material known as asbestos in English). The ancients already recognized certain hazards of the material. The Greek geographer Strabo and the Roman naturalist Pliny the Elder noted that the material damaged lungs of slaves who wove it into cloth. Charlemagne, the first Holy Roman Emperor, is said to have had a tablecloth made of asbestos. Wealthy Persian, who bought asbestos imported over the Hindu Kush , amazed guests by cleaning the cloth by simply exposing it to fire. According to Biruni in his book of Gems, any cloths made of asbestos ( , āzarshast or , āzarshab) were called ( ) shastakeh. Some of the Persians believed the fiber was fur from an animal (named samandar, ) that lived in fire and died when exposed to water. While traveling to China, Marco Polo described observing miraculous garments that were cleaned by being placed in fires . These garments were likely made from asbestos . Some archeologists believe that ancients made shrouds of asbestos, wherein they burned the bodies of their kings, in order to preserve only their ashes, and prevent their being mixed with those of wood or other combustible materials commonly used in funeral pyres.Others assert that the ancients used asbestos to make perpetual wicks for sepulchral or other lamps. In more recent centuries, asbestos was indeed used for this purpose. Although asbestos causes skin to itch upon contact, ancient literature indicates that it was prescribed for diseases of the skin, and particularly for the itch. It is possible that they used the term asbestos for alumen plumosum, because the two terms have often been confused throughout history. Asbestos became more widespread during the industrial revolution; in the 1860s it was used as insulation in the U.S. and Canada. Development of the first commercial asbestos mine began in 1879 in the Appalachian foothills of Quebec . By the mid 20th century uses included fire retardant coatings, concrete, bricks, pipes and fireplace cement, heat, fire, and acid resistant gaskets, pipe insulation, ceiling insulation, fireproof drywall, flooring, roofing, lawn furniture, and drywall joint compound. Approximately 100,000 people in the United States have died, or will die, from asbestos exposure related to ship building. In the Hampton Roads area, a shipbuilding center, mesothelioma occurrence is seven times the national rate. Thousands of tons of asbestos were used in World War II ships to wrap the pipes, line the boilers, and cover engine and turbine parts. There were approximately 4.3 million shipyard workers in the United States during WWII; for every thousand workers about fourteen died of mesothelioma and an unknown number died from asbestosis. Asbestos fibers were once used in automobile brake pads, shoes, and clutch discs. Since the mid-1990s, a majority of brake pads, new or replacement, have been manufactured instead with linings made of ceramic, carbon, metallic and Aramid fiber (Twaron or Kevlar—the same material used in bulletproof vests). The first documented death related to asbestos was in 1906. In the early 1900s researchers began to notice a large number of early deaths and lung problems in asbestos mining towns. The first diagnosis of asbestosis was made in England in 1924. By the 1930s, England regulated ventilation and made asbestosis an excusable work related disease, about ten years sooner than the U.S. The term Mesothelioma was not used in medical literature until 1931, and was not associated with asbestos until sometime in the 1940s. The United States government and asbestos industry have been criticized for not acting quickly enough to inform the public of dangers, and to reduce public exposure. In the late 1970s court documents proved that asbestos industry officials knew of asbestos dangers since the 1930s and had concealed them from the public. In Japan, particularly after World War II, asbestos was used in the manufacture of ammonium sulfate for purposes of rice production, sprayed upon the ceilings, iron skeletons, and walls of railroad cars and buildings (during the 1960s), and used for energy efficiency reasons as well. Production of asbestos in Japan peaked in 1974 and went through ups and downs until about 1990, when production began to drop severely. In the European Union and Australia it has recently been banned as a potential health hazard and is not used at all. Japan is moving in the same direction, but more slowly. Revelations that hundreds of workers had died in Japan over the previous few decades from diseases related to asbestos sparked a scandal in mid-2005. Tokyo had, in 1971, ordered companies handling asbestos to install ventilators and check health on a regular basis; however, the Japanese government did not ban crocidolite and amosite until 1995, and a full-fledged ban on asbestos was implemented in October 2004. 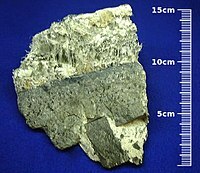 Five types of asbestos are found in the amphibole group: amosite, crocidolite, anthophyllite, tremolite, and actinolite. Amosite, the second most likely type to be found in buildings, according to the U.S. EPA Asbestos Building Inspectors Guide, is the "brown" asbestos. Chrysotile asbestos, like all other forms of asbestos, has produced tumors in animals. Mesotheliomas have been observed in people who were occupationally exposed to chrysotile, family members of the occupationally exposed, and residents who lived close to asbestos factories and mines. Amosite and crocidolite are the most hazardous of the asbestos minerals because of their long persistence in the lungs of exposed people. Tremolite often contaminates chrysotile asbestos, thus creating an additional hazard. Asbestos exposure becomes a health concern when high concentrations of asbestos fibers are inhaled over a long time period. People who become ill from inhaling asbestos are often those who are exposed on a day-to-day basis in a job where they worked directly with the material. As a person's exposure to fibers increases, because of being exposed to higher concentrations of fibers and/or by being exposed for a longer time, then that person's risk of disease also increases. Disease is very unlikely to result from a single, high-level exposure, or from a short period of exposure to lower levels. Smoking combined with asbestos exposure may increase the health risk dramatically. Asbestos warts: caused when the sharp fibers lodge in the skin and are overgrown causing benign callus-like growths. Pleural plaques: discrete fibrous or partially calcified thickened area which can be seen on X-rays of individuals exposed to asbestos. Although pleural plaques are themselves asymptomatic, in some patients this develops into pleural thickening. Diffuse pleural thickening: similar to above and can sometimes be associated with asbestosis. Usually no symptoms shown but if exposure is extensive, it can cause lung impairment. Most respirable asbestos fibers are invisible to the unaided human eye because their size is about 3.0–20.0 µm long and can be as thin as 0.01 µm. Human hair ranges in size from 17 to 181 µm in width. Fibers ultimately form because when these minerals originally cooled and crystallized, they formed by the polymeric molecules lining up parallel with each other and forming oriented crystal lattices. These crystals thus have three cleavage planes, just as other minerals and gemstones have. But in their case, there are two cleavage planes that are much weaker than the third direction. When sufficient force is applied, they tend to break along their weakest directions, resulting in a linear fragmentation pattern and hence a fibrous form. This fracture process can keep occurring and one larger asbestos fiber can ultimately become the source of hundreds of much thinner and smaller fibers. As asbestos fibers get smaller and lighter, they more easily become airborne and human respiratory exposures can result. Fibers will eventually settle but may be re-suspended by air currents or other movement. Friability of a product containing asbestos means that it is so soft and weak in structure that it can be broken with simple finger crushing pressure. Friable materials are of the most initial concern because of their ease of damage. The forces or conditions of usage that come into intimate contact with most non-friable materials containing asbestos are substantially higher than finger pressure. Asbestos can be found naturally in the air outdoors and in some drinkable water, including water from natural sources. Studies have shown that members of the general (non-occupationally exposed) population have tens of thousands to hundreds of thousands of asbestos fibers in each gram of dry lung tissue, which translates into millions of fibers and tens of thousands of asbestos bodies in every person's lungs. Asbestos from natural geologic deposits is known as "Naturally Occurring Asbestos" (NOA). Health risks associated with exposure to NOA are not yet fully understood, and current US federal regulations do not address exposure from NOA. Many populated areas are in proximity to shallow, natural deposits which occur in 50 of 58 California counties and in 19 other U.S. states. In one study, data was collected from 3,000 mesothelioma patients in California and 890 men with prostate cancer, a malignancy not known to be related to asbestos. The study found a correlation between the incidence of mesotheliomas and the distance a patient lived from known deposits of rock likely to include asbestos, the correlation was not present when the incidence of prostate cancer was compared with the same distances. According to the study, risk of mesothelioma declined by 6 percent for every 10 kilometers that an individual had lived away from a likely asbestos source. Portions of El Dorado County, California are known to contain natural asbestos formations near the surface. The USGS studied amphiboles in rock and soil in the area in response to an EPA sampling study and subsequent criticism of the EPA study. The study found that many amphibole particles in the area meet the counting rule criteria used by the EPA for chemical and morphological limits, but do not meet morphological requirements for commercial-grade-asbestos. The executive summary pointed out that even particles that do not meet requirements for commercial-grade-asbestos may be a health threat and suggested a collaborative research effort to assess health risks associated with "Naturally Occurring Asbestos." Large portions of Fairfax County, Virginia were also found to be underlain with tremolite. The county monitored air quality at construction sites, controlled soil taken from affected areas, and required freshly developed sites to lay of clean, stable material over the ground. By the first century AD, Greeks and Romans had already observed, at least in passing, that slaves involved in the weaving of asbestos cloth were afflicted with a sickness of the lungs. Early concern in the modern era on the health effects of asbestos exposure can be found in several sources. Among the earliest were reports in Britain. The annual reports of the Chief Inspector of Factories reported as early as 1898 that asbestos had "easily demonstrated" health risks. At about the same time, what was probably the first study of mortality among asbestos workers was reported in France. While the study describes the cause of death as chalicosis, a generalized pneumoconiosis, the circumstances of the employment of the fifty workers whose death prompted the study suggest that the root cause was asbestos or mixed asbestos-cotton dust exposure. Further awareness of asbestos-related diseases can be found in the early 1900s, when London doctor H. Montague Murray conducted a post mortem exam on a young asbestos factory worker who died in 1899. Dr. Murray gave testimony on this death in connection with an industrial disease compensation hearing. The post-mortem confirmed the presence of asbestos in the lung tissue, prompting Dr. Murray to express as an expert opinion his belief that the inhalation of asbestos dust had at least contributed to, if not actually caused, the death of the worker. All of these processes unquestionably involve a considerable dust hazard, but the hygienic aspects of the industry have not been reported upon. It may be said, in conclusion, that in the practice of American and Canadian life insurance companies, asbestos workers are generally declined on account of the assumed health-injurious conditions of the industry. Widespread recognition of the occupational risks of asbestos in Britain was reported in 1924 by a Dr. Cooke, a pathologist, who introduced a case description of a 33-year-old female asbestos worker with the following: "Medical men in areas where asbestos is manufactured have long suspected the dust to be the cause of chronic bronchitis and fibrosis..." Dr. Cooke then went on to report on a case in 1927 involving a 33-year-old male worker who was the only survivor out of ten workers in an asbestos carding room. In the report he named the disease "asbestosis". Dr. Cooke's second case report was followed, in the late 1920s, by a large public health investigation (now known as the Merewether report after one of its two authors) that examined some 360 asbestos-textile workers (reported to be about 15% of the total comparable employment in Britain at the time) and found that about a quarter of them suffered from pulmonary fibrosis. This investigation resulted in improved regulation of the manufacturing of asbestos-containing products in the early 1930s. Regulations included industrial hygiene standards, medical examinations, and inclusion of the asbestos industry into the British Workers' Compensation Act . The first known U.S. workers' compensation claim for asbestos disease was in 1927. In 1930, the first reported autopsy of an asbestosis sufferer was conducted in the United states and later presented by a doctor at the Mayo Clinic, although in this case the exposure involved mining activities somewhere in South America. In 1930, the major asbestos company Johns-Manville produced a report, for internal company use only, about medical reports of asbestos worker fatalities. In 1932, A letter from U.S. Bureau of Mines to asbestos manufacturer Eagle-Picher stated, in relevant part, "It is now known that asbestos dust is one of the most dangerous dusts to which man is exposed." In 1933, Metropolitan Life Insurance Co. doctors found that 29% of workers in a Johns-Manville plant had asbestosis. Likewise, in 1933, Johns-Manville officials settled lawsuits by 11 employees with asbestosis on the condition that the employees' lawyer agree to never again "directly or indirectly participate in the bringing of new actions against the Corporation." In 1934, officials of two large asbestos companies, Johns-Manville and Raybestos-Manhattan, edited an article about the diseases of asbestos workers written by a Metropolitan Life Insurance Company doctor. The changes downplayed the danger of asbestos dust. In 1935, officials of Johns-Manville and Raybestos-Manhattan instructed the editor of Asbestos magazine to publish nothing about asbestosis. In 1936, a group of asbestos companies agreed to sponsor research on the health effects of asbestos dust, but required that the companies maintain complete control over the disclosure of the results. In 1942, an internal Owens-Corning corporate memo referred to "medical literature on asbestosis.... scores of publications in which the lung and skin hazards of asbestos are discussed." Either in 1942 or 1943, the president of Johns-Manville, Lewis H. Brown, said that the managers of another asbestos company were "a bunch of fools for notifying employees who had asbestosis." When one of the managers asked, "do you mean to tell me you would let them work until they dropped dead?" the response is reported to have been, "Yes. We save a lot of money that way." In 1944, a Metropolitan Life Insurance Company report found 42 cases of asbestosis among 195 asbestos miners. In 1951, asbestos companies removed all references to cancer before allowing publication of research they sponsored. In 1952, Dr. Kenneth Smith, Johns-Manville medical director, recommended (unsuccessfully) that warning labels be attached to products containing asbestos. Later, Smith testified: "It was a business decision as far as I could understand...the corporation is in business to provide jobs for people and make money for stockholders and they had to take into consideration the effects of everything they did and if the application of a caution label identifying a product as hazardous would cut into sales, there would be serious financial implications." In 1953, National Gypsum's safety director wrote to the Indiana Division of Industrial Hygiene, recommending that acoustic plaster mixers wear respirators "because of the asbestos used in the product." Another company official noted that the letter was "full of dynamite" and urged that it be retrieved before reaching its destination. A memo in the files noted that the company "succeeded in stopping" the letter, which "will be modified." Through the 1970s, asbestos was used to fireproof roofing and flooring, for heat insulation, and for a variety of other purposes. In 1989 the United States Environmental Protection Agency (EPA) issued the Asbestos Ban and Phase Out Rule which was subsequently overturned in the case of Corrosion Proof Fittings v. U.S. Environmental Protection Agency, 1991. This ruling leaves many consumer products that can still legally contain trace amounts of asbestos. For a clarification of products which legally contain asbestos read the EPA's clarification statement. The EPA has proposed a concentration limit of seven million fibers per liter of drinking water for long fibers (lengths greater than or equal to 5 µm). The Occupational Safety and Health Administration (OSHA), has set limits of 100,000 fibers with lengths greater than or equal to 5 µm per cubic meter of workplace air for eight-hour shifts and 40-hour work weeks. In 1984, the import of raw amphibole (blue and brown) asbestos into New Zealand was banned. In 2002 the import of chrysotile (white) asbestos was banned. A complete ban on asbestos-containing material in Australia was introduced in 1991 although some building materials in storage were still being used in the years that followed. Queensland began regulation of asbestos removal and disposal in 2005. Handlers of asbestos materials must have a B-Class license for bonded asbestos and an A-Class license for friable asbestos. The town of Wittenoom , in Western Australia was built around a (blue) asbestos mine. The town has since been closed, and is contaminated. However one couple remains there, refusing to leave the area and refusing to believe in current medical advice. Conversely, the town of Asbestos , in Quebec , which remains the world's largest open pit asbestos mine, retains a significant population, albeit one that aged as a result of the failure of Magnola, a multi-million plant designed to extract magnesium from asbestos tailings. Vermiculite is a hydrated laminar magnesium-aluminum-iron silicate which resembles mica. It can be used for many industrial applications and has been used as a replacement for asbestos. Some ore bodies of vermiculite have been found to contain small amounts of asbestos. One vermiculite mine operated by W. R. Grace and Company in Libby, Montana exposed workers and community residents to danger by mining contaminated vermiculite. In 1999 the EPA began cleanup efforts and now the area is a Superfund cleanup area. The EPA has determined that harmful asbestos is released from the mine as well as through other activities that disturb soil in the area. Talc is sometimes contaminated with asbestos. In 2000, tests in a certified asbestos-testing laboratory found the tremolite form of amphibole asbestos in three out of eight major brands of children's crayons (oil pastels) that are made partly from talc — Crayola, Prang, and Rose Art. In Crayola crayons, the tests found asbestos levels from 0.05% in Carnation Pink to 2.86% in Orchid; in Prang crayons, the range was from 0.3% in Periwinkle to 0.54% in Yellow; in Rose Art crayons, it was from 0.03% in Brown to 1.20% in Orange. Overall, 32 different types of crayons from these brands contained more than trace amounts of asbestos, and eight others contained trace amounts. The Art and Creative Materials Institute, a trade association which tests the safety of crayons on behalf of the makers, initially insisted the test results must be incorrect, although they later said they do not test for asbestos. In May 2000, Crayola said tests by a materials analyst, Richard Lee, whose testimony has been accepted in lawsuits over 250 times on behalf of the asbestos industry, showed two of its crayons were negative for asbestos. In June 2000, Binney & Smith, the maker of Crayola, and the other makers agreed to stop using talc in their products, and changed their product formulations in the United States. The mining company, R T Vanderbilt Co of Gouverneur, New York , which supplied the talc to the crayon makers, insists there is no asbestos in its talc "to the best of our knowledge and belief", but a news article claimed that the United States Mine Safety and Health Administration (MSHA) did find asbestos in four talc samples that it tested in 2000. At the time, however, the Assistant Secretary for Mine Safety and Health informed the news reporter that his article was in error and that the reporter had misquoted him stating that “In fact, the abbreviation ND (non detect) in the laboratory report – indicates no asbestos fibers actually were found in the samples.” Further supporting the claim of Vanderbilt that asbestos is not found in this industrial grade talc (composed of a very complex mineral mixture) is a decades old record of analytical work that does not find asbestos in this talc by mineral scientists in academia, government and contract laboratories. Human, animal and cell health studies conducted on Vanderbilt’s controversial talc also lend no support for the presence of asbestos in this talc. There does exist several non fully peer reviewed health reports concerning Vanderbilt talc that does suggest a "same as" asbestos risk some of which were referenced in the previously cited news articles. The ongoing issue of asbestos in Vanderbilt talc (a product no longer mined), highlights the importance of recognizing all pertinent available information. When reviewing controversial scientific issues it is important to recognize and avoid selective, sensationalized, incomplete and at times incorrect information. The use of asbestos in new construction projects has been banned for health and safety reasons in many developed countries or regions, including the European Union, Australia, Hong Kong , Japan, and New Zealand. A notable exception is the United States, where asbestos continues to be used in construction such as cement asbestos pipes. Until the mid-1980s, white asbestos was used in the manufacture of Artex, a decorative stipple finish. Some developing countries, such as India and China , have continued widespread use of asbestos. The most common is corrugated asbestos-cement sheets or "A/C Sheets" for roofing and for side walls. Millions of homes, factories, schools or sheds and shelters continue to use asbestos. Cutting these sheets to size and drilling holes to receive 'J' bolts to help secure the sheets to roof framing is done on site. There has been no significant change in production and use of A/C Sheets in developing countries following the widespread restrictions in developed nations. Asbestos litigation is the longest, most expensive mass tort in U.S. history, involving more than 8,400 defendants and 730,000 claimants as of 2002 according to the RAND Corporation, and at least one defendant reported claim counts in excess of $800,000 in 2006. Current trends indicate that the worldwide rate at which people are diagnosed with asbestos-related diseases will likely increase through the next decade. Analysts have estimated that the total costs of asbestos litigation in the USA alone is over $250 billion. The Federal legal system in the United States has been faced with numerous counts of asbestos related suits, which often included multiple plaintiffs with similar symptoms. The concern with these court cases are the staggering numbers, which in 1999 recorded 200,000 cases pending in the Federal court system of the United States . Further, it is estimated that within the next 40 years, cases may balloon to seven hundred thousand cases. These numbers help explain how there are thousands of current pending cases. Litigation of asbestos materials has been a difficult entity to muster because of the multiple factors which play a role in every case. The company that often is being exposed for their negligence of working conditions and the worker or in many cases, workers who were exposed to asbestos and did not know that they were, or knew and now fear future medical problems, have current symptoms or were upset for the negligence of the company. Companies sometimes counter saying that health issues do not currently appear in their worker or workers, or sometimes are settled out of court. The Research and Development (RAND) think-tank has appropriated certain legal information which is readily available for proclaimed victims of natural resource accidents. This information, although sometimes deemed radical, has helped many workers, regardless of health condition, earn compensation through companies. RAND, along with the Institute for Civil Justice (ICJ) have been proponents of the organization of past cases in order to determine one aspect of fair compensation for workers. 1999 saw the introduction of the Fairness in Asbestos Compensation Act. This Act was used as a tool in order to determine which of the numerous federal cases were true, and if the plaintiff’s were actually suffering from asbestos related illness. This process was necessary as thousands of false insurance claims were costing companies billions and ultimately many companies were forced to file for bankruptcy. While companies filed for bankruptcy, this limited payouts to those who were actually affected by the material. What the 1999 Act ultimately determined was “a judgment that those resources should be spent on delivering full and prompt compensation to those who are, and will become, impaired by asbestos disease, and not dissipated on payments to those who are not sick and may never become sick, on punitive damages that seek retribution for the decisions of long-dead executives for conduct that took place decades ago and on the extraordinary transaction costs (Professor Christopher Edley, Jr.).” With this litigation, it was recommended by many that the framework of the Act was set in a manner that was fair towards most parties. There is no effective way to allocate funding to every claimant with the fair treatment of companies in question. Although a majority of companies involved with numerous asbestos cases are household names, they are also at the highest risk while faced with workers health concerns. The 1999 Act has effectively helped save time, money and aggravation for both sides of every asbestos case. There are fewer cases of bankruptcy and fewer cases of fraudulent medical concerns. Notable concerns with bankruptcy include the fact that once a company is forced to divide funding amongst its workers, it has a limited budget which lags on the economy and ultimately cannot contribute back the way it once was. This was a main reason for the hesitation of any strict enforcement policy. However, the Act of 1999 helps to alleviate exuberant payouts to unqualified claimants, all while safely and legally protecting those who were, are and will be affected by asbestos related illnesses. Litigation exists outside the United States in England, Scotland, Ireland, the Netherlands, France, Australia, and Japan among other nations. See the companion article for further information. The volume of the asbestos liability has concerned manufacturers and insurers and reinsurers. The amounts and method of allocating compensation have been the source of many court cases, and government attempts at resolution of existing and future cases. According to Natural Resources Canada , chrysotile asbestos is not as dangerous as once thought. According to their fact sheet, "...current knowledge and modern technology can successfully control the potential for health and environmental harm posed by chrysotile". In May 1998, Canada requested consultations before the WTO with the European Commission concerning France 's 1996 prohibition of the importation and sale of asbestos. Canada claimed that the French measures contravened provisions of the Agreements on Sanitary and Phytosanitary Measures and on Technical Barriers to Trade, and the GATT 1994. The EC said that substitute materials had been developed in place of asbestos, which are safer to human health. It stressed that the French measures were not discriminatory, and were fully justified for public health reasons. The EC said that in the July consultations, it had tried to convince Canada that the measures were justified, and that just as Canada broke off consultations, it was in the process of submitting substantial scientific data in favour of the asbestos ban. Critics of Canada's support of the use of chrysotile asbestos argue that Canada is ignoring the risks associated with the material. The CFMEU pointed out that selling asbestos is illegal in Canada, but it is exported and most exports go to developing countries. Canada has pressured countries, including Chile , and the UN to avoid asbestos bans. Asbestos regulation critics include Junkscience.com author and Fox News columnist Steven Milloy and the asbestos industry. Critics sometimes argue that increased regulation does more harm than good and that replacements to asbestos are inferior. An example is the suggestion by Dixy Lee Ray and others that the shuttle Challenger exploded because the maker of O-ring putty was pressured by the EPA into ceasing production of asbestos-laden putty. However, scientists point out that the putty used in Challenger s final flight did contain asbestos, and failures in the putty were not responsible for the failure of the O-ring that led to loss of the shuttle. Asbestos was used in the first forty floors of the World Trade Center towers causing an airborne contamination among lower Manhattan after the towers collapsed in the attacks on September 11th, 2001. Steven Milloy suggests that the World Trade Center towers could still be standing or at least would have stood longer had a 1971 ban not stopped the completion of the asbestos coating above the 64th floor . This was not considered in the National Institute of Standards and Technology's report on the towers' collapse. All fireproofing materials, regardless of what they are made of are required to obtain a fire-resistance rating prior to installation. All fibre-based lightweight commercial spray fireproofing materials are vulnerable to kinetic energy impacts that are outside of the fire testing upon which their ratings are based, including asbestos-based materials, and would have been removed in large areas by the impact of the planes. Fiberglass insulation was invented in 1938 and is now the most commonly used type of insulation material. The safety of this material is also being called into question, as research shows that the composition of this material causes similar toxicity as asbestos. In Europe stone- and glasswool are the main insulators in houses. Many companies that produced asbestos-cement products that were reinforced with asbestos fibres have developed products incorporating organic fibres. One such product was known as Eternit and another "Everite" now use "Nutec" fibres which consist of organic fibres, portland cement and silica. Cement-bonded wood fiber is another substitute.Stonefibres are used in gaskets and friction materials. 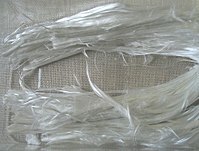 Another potential fiber is polybenzimidazole or PBI fiber. Polybenzimidazole fiber is a synthetic fiber with high melting point of 760 °C that also does not ignite. Because of its exceptional thermal and chemical stability, it is often used by fire departments and space agencies. Asbestos alternatives for industrial use include sleeves, rope, tape, fabric and insulation batt materials made from fiberglass and silica. Asbestos can also be recycled by transforming it into harmless silicate glass. A process of thermal decomposition at 1000–1250 °C produces a mixture of non-hazardous silicate phases, and at temperatures above 1250 °C it produces silicate glass. Microwave thermal treatment can be used in an industrial manufacturing process to transform asbestos and asbestos-containing waste into porcelain stoneware tiles, porous single-fired wall tiles, and ceramic bricks. History of science This article incorporates content from the 1728 Cyclopaedia, a publication in the public domain. "Not in Their Back Yard", Mother Jones, May/June 2007. D. Auribault, "Note sur l'Hygiène et la Sécurité des Ouvriers dans les Filatures et Tissages d'Amianté (On hygiene and security of the workers in the spinning and weaving of asbestos)" in Le Bulletin de l'Inspection du Travail, 1906, pp 120–132. This summary was given by Brodeur~~~~ and roughly confirmed by Merewether & Price in the report cited below. H. M. Murray, testimony before the Departmental Committee on Compensation for Industrial Diseases "Minutes of Evidence, Appendices and Index", 1907. pg 127 cited and summarized in Merewether & Price referenced below. F. L. Hoffman, "Mortality from Respiratory Diseases in Dusty Trades", Bulletin of the U.S. Bureau of Labor Statistics, Vol. 231, pp 176–180. Mr. Hoffman was a professional statistician, employed by Prudential with an international reputation on public health matters. W. E. Cooke, "Fibrosis of the Lungs Due to the Inhalation of Asbestos Dust", British Medical Journal, 1927, pg. 487. Geoffrey Tweedale, Magic Mineral to Killer Dust, Turner & Newall and the Asbestos Hazard, Oxford University Press, 2001, page 21. ISBN 0199243999. R. G. Mills, "Pulmonary Asbestosis: Report of a Case", Minnesota Medicine, July 1930, pp 495–499. Barry I. Castleman, Asbestos: Medical and Legal Aspects, 4th edition, Aspen Law and Business, Englewood Cliffs, NJ, 1996, p.195. Testimony of Charles H. Roemer, Deposition taken April 25, 1984, Johns-Manville Corp., et al. v. the United States of America, U.S. Claims Court Civ. No. 465-83C, cited in Barry I. Castleman, Asbestos: Medical and Legal Aspects, 4th edition, Aspen Law and Business, Englewood Cliffs, NJ, 1996, p.581. ToxFAQs for Asbestos, Agency for Toxic Substances and Disease Registry. Smartt, Pamela. "Mortality, morbidity, and asbestosis in New Zealand: the hidden legacy of asbestos exposure". The New Zealand Medical Journal, 5 November 2004, Vol. 117, No. 1205. J .Davitt McAteer, Assist. Secretary for Mine Safety and Health correspondence to Andrew Schneider of the Seattle Post-Intelligencer dated June 14, 2000 – copy obtainable through records archives MSHA. Van Orden, D., R. J. Lee: Weight Percent Compositional Analysis of Seven RTV Talc Samples. Analytical Report to R. T. Vanderbilt Company, Inc. Nov. 22, 2000. Submitted to Public Comments Record - C. W. Jameson, National Toxicology Program, 10th ROC Nominations "Talc (containing asbestiform fibers)". Dec. 4, 2000. Nord, G. L, S. W. Axen, R. P. Nolan: Mineralogy and Experimental Animal Studies of Tremolitic Talc. Environmental Sciences Laboratory, Brooklyn College, The City University of New York. Submitted to Public Comments Record - C. W. Jameson, National Toxicology Program, 10th ROC Nominations "Talc (containing asbestiform fibers)". December 1, 2000. Kelse, J. W., C. Sheldon Thompson: The Regulatory and Mineralogical Definitions of Asbestos and Their Impact on Amphibole Dust Analysis. Am. Ind. Hyg. Assoc. J. 50(11) pp. 613-622 (1989). Wylie, A.G.: Report of Investigation. Analytical Report on RTV talc submitted to R. T. Vanderbilt Company, Inc. Feb. 13, 1987 (Submitted to Public Comments Record - C. W. Jameson, National Toxicology Program, 10th ROC Nominations "Talc (containing asbestiform fibers)". June 2, 2000. Crane, D.: Letter to Greg Piacitelli (NIOSH) describing the analytical findings of the Occupational Safety and Health Administration regarding R. T. Vanderbilt Talc. Nov. 26, 1986 (In OSHA Docket H-33-d and In Public Comments Record - C. W. Jameson, National Toxicology Program, 10th ROC Nominations - June 2, 2000). Crane, D.: Background Information Regarding the Analysis of Industrial Talcs. Letter to the Consumer Product Safety Commission from the Occupational Safety and Health Administration. June 12, 2000 (Appended to CPSC Staff Report on "Asbestos in Children’s Crayons" Aug. 2000). McCrone Associates - Atlanta Lab. : Report on the Analysis of Paint CLS-5067-1 and Mineral Filler CLS-N-439-1. To Unspecified Paint Company Sept. 23, 1992. (Submitted to Public Comments Record - C. W. Jameson, National Toxicology Program, 10th ROC Nominations "Talc (containing asbestiform fibers)". June 2, 2000. Langer, A. M., R. P. Nolan: Mineralogical Characterization of Vanderbilt Talc Specimens & Comparison of the 1976 Rohl Talc Report to NIOSH and Analysis Performed in 1988. In Public Comments - Nat’l Toxicology Program 10th ROC review. W. Jameson NIEHS MED EC-14, 79 Alexander Drive Research Triangle Park, NC "Talc (containing asbestiform fibers)". Nov. 2000. United States Department of the Interior: Selected Silicate Minerals and Their Asbestiform Varieties by W. J. Campbell, et al (Bureau of Mines Information Circular, I. C. 8751). Washington, D.C.: Dept. of the Interior, Bureau of Mines. (1977). Stille, W. T., I. R. Tabershaw: The Mortality Experience of Upstate New York Talc Workers, J. Occ. Med. v. 24 #6 pp. 480-484. (1982). Lamm, S. H.: Absence of Lung Cancer Risk from Exposure to Tremolitic Talc - Retrospective Mortality Study, Study presented to the R. T. Vanderbilt Company, Inc. Feb. 14, 1986. (In OSHA Docket H-33-d). Lamm, S. H., M. Levine, J. Starr, J. Tirey: Analysis of Excess Lung Cancer Risk in Short-Term Employees, Am. J. of Epid. v. 127 #6 pp. 1202-1209. (1988). Boehlecke, B.: Results of Medical Surveillance Examinations Performed Every 2 Years on Workers at the Gouverneur Talc Company (1985 -2000): Submitted to Public Comments Record - C. W. Jameson, National Toxicology Program, 10th ROC Nominations "Talc (containing asbestiform fibers)". (Nov. 19, 2000). (Partial in OSHA Docket H-33-d, 1988). Gamble, J.: A Nested Case Control Study of Lung Cancer Among New York Talc Workers, Int. Arch. Occup. Envir. Health 64 pp. 449-456. (1993). Honda, Y., C. Beall, E. Delzell, K. Oestenstad, I. Brill, R. Matthews: Mortality Among Workers at a Talc Mining and Milling Facility. Submitted and accepted - Am. Occup. Hyg. May 10, 2002. (In Public Comments - NTP 10th ROC C.W. Jameson NIEHS MD EC-14, 79 Alexander Drive Research Triangle Park, NC 27709). Smith, W. E., D. Hubert, H. Sobel, E. Marquet: Biologic Tests of Tremolite I Hamsters, Dusts and Disease, R. Lemen & J. Dement Editors, Proceedings of the Conference on Occupational Exposures to Fibrous and Particulate Dust and Their Extension into the Environment. Pathotox Pub. Park Forest S. IL. pp 335-339. (1979). Stanton, M. F., M. Layard, A. Tegeris, E. Miller, M. May. E. Morgan, A Smith: Relation of Particle Dimension to Carcinogenicity in Amphibole Asbestosis and Other Fibrous Minerals, JNCI 67, pp. 965-975. (1981). National Institute for Occupational Safety and Health: Occupational Exposure to Talc Containing Asbestos, Brown, D. P., J. Wagoner, J.M. Dement, R. D. Zumwalde, J. Gamble, W Fellner, M. DeMeo, NIOSH Publ. No. 80-115 (1980). Hull MJ.. Abraham JL & Case BW (2002) Mesothelioma among Workers in Asbestiform Fiber-bearing Talc Mines in New York State. Annals of Occupational Hygiene 46 (Supplement 1): 132-135. Where can asbestos be found, Asbestos Surveying Ltd, Birmingham, UK, 02-08-2008.Accessed: 12-29-2008. Control of Asbestos Regulations 2006, Health and Safety Exceutive, London, UK, Undated.Accessed: 12-29-2008. United States. Cong. Hearing: Asbestos Litigation. 107th Cong., 2nd sess. HRG.107-993. Washington: GPO, 2002. Carroll, Stephen J., Deborah Hensler, Allan Abrahamse, Jennifer Gross, Michelle White, Scott Ashwood, and Elizabeth Sloss. Asbestos Litigation Costs and Compensation. Santa Monica,CA: RAND, 2002. United States. Cong. Senate. Finding Solutions to the Asbestos Litigation Problem: the Fairness in Asbestos Compensation Act of 1999. 106nd Cong., 1st sess. S.758. Washington: GPO, 1999. CBC Digital Archives - Asbestos: Magic mineral or deadly dust? The Wittenoom Tragedy, Asbestos Diseases Society of Australia. Asbestos Danger: Do You Have Zonolite In Your Attic?